Dealing with other galactic civilizations brought out the real jerk in me. Normally safely tucked away in a far corner of my mind, the jerk finally had the chance to show himself and really run riot. While your subjects are basically faceless numbers on a spreadsheet (no matter how cute their on-screen representations are), the other civilizations are your peers and equals. Master of Orion II may cast you as a dictator of your people (whether you are one or not) by virtue of its colony management system, but as far as your interaction with the rest of the universe is concerned, you have no such excuse. I didn't have to play as a jerk. It is entirely possible to win a peaceful victory by having a number of allies declare you president of the galaxy, or even save the universe from an ancient race, the Antarans. But where's the fun in that? Some of the other races are so belligerent that you are forced to defend yourself and once you have a giant war-fleet staffed with people who can mind-control entire planetary populations, so ran the reasoning of my far younger self, it's a shame not to use it. And so it was that, after the Great Alliance rid the universe of the repulsive Silicoids and the inscrutable Klackon hive mind, the tenuous peace was almost immediately shattered when some of my smaller allies saw my massive fleet descending on their outer colonies. If I'd had a moustache at that age, I'd have twirled it vigorously. I made one rather crucial error though. Not being versed in Machiavellian state-craft, I made the rookie mistake of allying myself with the biggest and baddest power in the galaxy, next to myself, so that I had time to gobble up the little bit-players. I should have done it the other way around, of course, teaming up with the little guys to bring down the biggest wolf in the pack, but such subtlety was lost on me in those days. All I could consider was tearing up the place with my buddies, the Psilons, who had the Creative trait, like my custom Darlocks. As veterans of MoO II know, Creative is the most broken ability in the game: Where normally you have to make hard choices in your research at each tier, a Creative race receives all research at a specific tier by just researching one project. 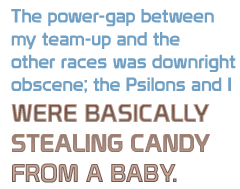 The power-gap between my team-up and the other races was, at that point in the game, downright obscene; the Psilons and I were basically stealing candy from a baby. The wars lasted for generations with the beleaguered races of the universe throwing everything they had at my technological might, but my inexorable advance ploughed through their domains like a force of nature. Their efforts to repel me were valiant and, on the surface, successful. While my researchers were busy exploring the inner workings of reality, my ageing fleet, not reinforced in decades, finally met its end. The battered remnants of my opponents breathed a collective sigh of relief, believing that they had weathered the worst of the storm. My latest acquisitions were quickly retaken and demands for immediate cessation of hostilities and copious reparations were sent to me in due course.